Phenology is the life cycle of an organism. HWA phenology is still being investigated since HWA has a complicated life cycle with multiple phases and changes in form. One of our research goals is to better understand HWA phenology in New York in order to accurately time our biocontrol releases. Here on the East Coast, HWA reproduces asexually and has two generations per year, both completed on hemlocks. Both generations found here complete non-winged life stages. In its native range, HWA has a winged sexual generation that is completed on spruce trees. You can help us track the phenology of HWA in New York. Visit our HWA Phenology Project page to learn how. The first generation (sistens generation) of HWA hatches in the early summer. HWA eggs hatch into nymphs known as “crawlers”, HWA’s only mobile phase. 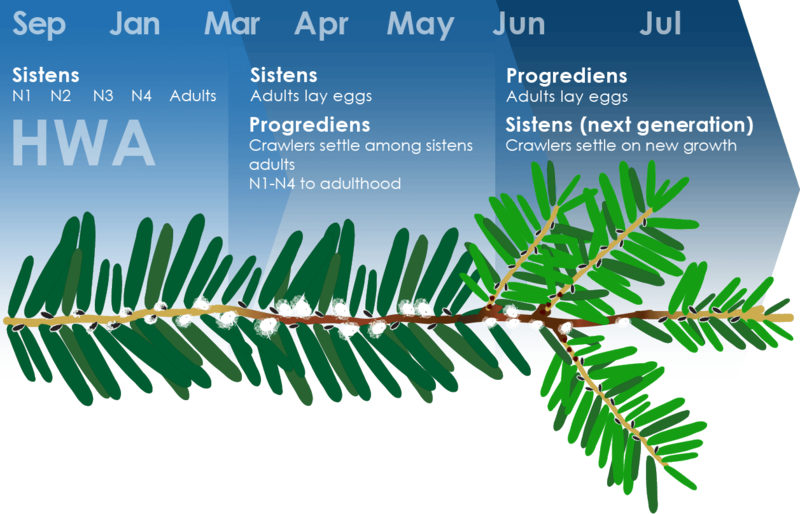 Crawlers settle on the tree’s new growth, insert their straw-like mouthparts (stylets) directly into the hemlock twig near the base of a needle, and immediately go into their dormant period (aestivation) for the summer season. Once settled, HWA nymphs remain sessile as they complete their life cycles. In the fall, HWA break their aestivation and begin to feed and develop. 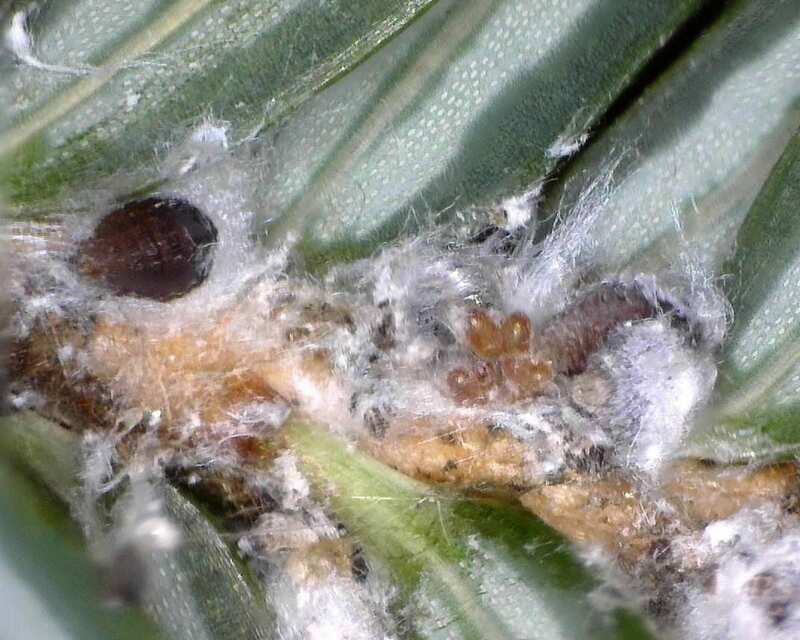 During this time they begin to secrete their characteristic wool, which appears as white, cottony-waxy, woolly masses clumped on hemlock twigs near the base of needles. HWA continues to grow and develop through the winter, completing four nymphal stages known as instars and growing from a length of ~0.2 mm to ~1 mm. HWA’s first generation reaches maturity at the end of winter, laying eggs in the early spring that hatch into the second generation (progrediens generation) crawlers. The second generation crawlers hatch at the beginning of spring. 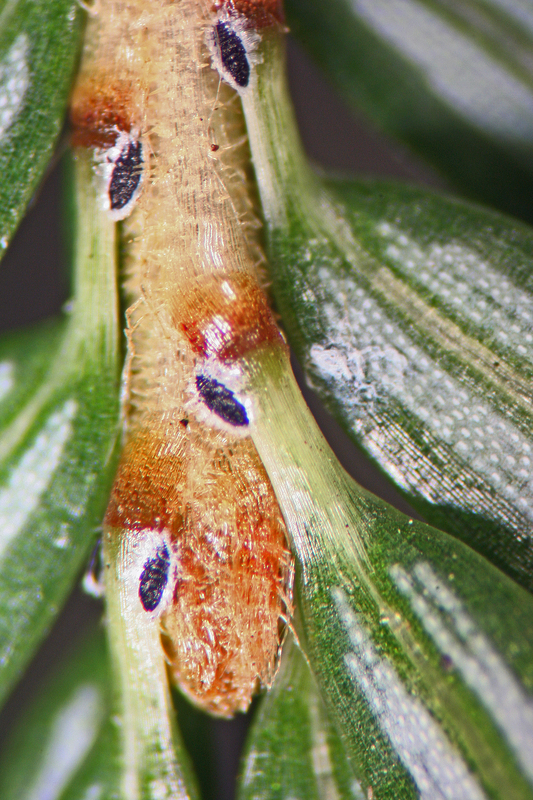 Once hatched, the crawlers settle on the hemlock twig, insert their mouthparts and immediately begin to feed, skipping the aestivation period. The second generation nymphs also go through 4 nymphal stages, reaching adulthood in the early summer and laying the eggs that will become the next year’s first generation of HWA. The timing of these major life stages is variable depending on the climate and local weather. We use the Nature’s Notebook mobile phone app to track the phenology of HWA, which helps us understand where and when to release our biocontrol insects. 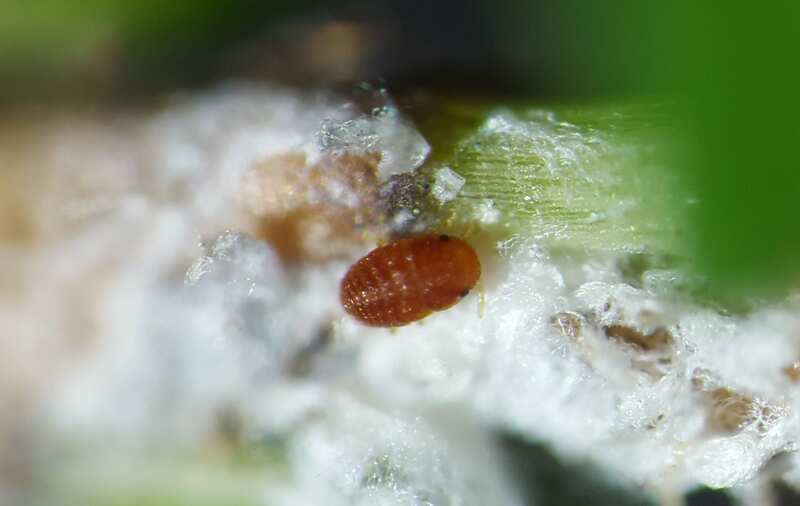 If HWA is in the incorrect life stages when predators are released, the biocontrol bugs will not have an adequate food source and will likely die, rendering biocontrol management at that site ineffective. Tracking HWA phenology across New York State helps us plan our biocontrol releases and match the life cycles of our predators with local HWA populations. Visit our Community Science page to learn about how to become an HWA Phenology Monitor. As HWA progresses through its life stages, there are some developmental milestones that overlap. This is especially clear as the sistens generation lays eggs and the progrediens generation is hatching and beginning to feed. The progrediens that hatch from the sistens eggs settle amongst their mothers, completing their development (4 instar stages) on the same section of twig as the previous generation. The feeding of the progrediens individuals in this already-stressed section of branch causes additional damage to the twig and, after several years, no new shoots will appear.